looks great in person. the size is perfect for our small table in the mother's room at our office. i would order this again for another office or home. 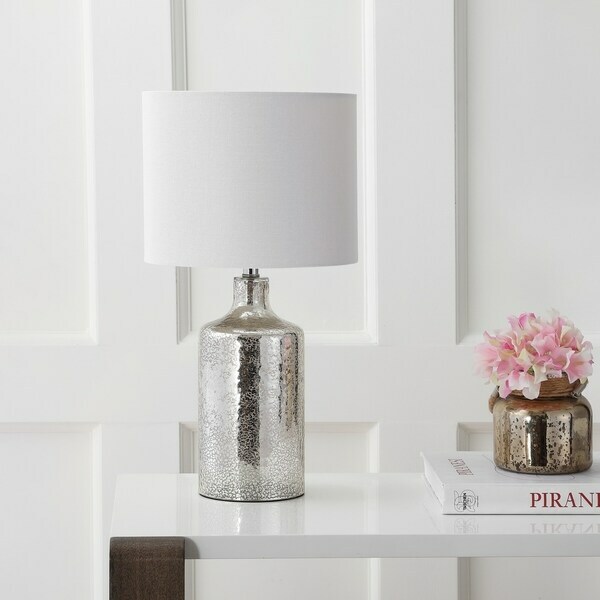 Make a sophisticated statement in any living room with this contemporary table lamp. Inspired by the work of glass artisans, it's designed with a chic white shade and a silver finish that illuminates its subtle texture and gentle curves. Dimensions 10.0 In. X 10.0 In. X 19.0 In. I LOVE this lamp. It is a perfect addition to our guest room. It is the perfect size for a night stand. 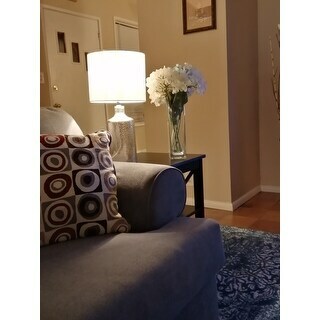 It would be too small if trying to use it in a family or living room, but perfect for a bedside lamp. Gorgeous lamps!! Will be purchasing another for the spare room. Love this lamp! Totally worth the money! Just as advertised! Exactly what I was looking for to complete my nightstand decor! I was also impressed by the overall shipping packaging all the pieces were well secured. "Is the base of this lamp open or does it have an actual bottom?" This lamp does not have an open bottom. Safavieh Lighting 17.5-inch Hanton Table Lamp - Silver - 10" x 10" x 17.5"